Things are getting a little CRAZY!! Hello and welcome back to our blog. Things have been heating up over the past 6 weeks and that is our (my) excuse for not updating the blog lately. At last writing, we were preparing to set tile on the first floor. We’re happy to repor that the first four units on the first floor are completed on the interior, leaving only the verandas. The tile came out beautifully including the bathrooms. The rooftop entertainment area tile is almost completed as well. Here on the rooftop is Laura and Marvin who is a maestro (Journeyman) and lives at the property to take care of night security. The 2nd spiral staircase is also completely finished and ready for tile (as seen on the far left of this photo). You can also note that the finish-plaster is happening on this side of the building. We’re also finishing up the back (road-side) and will complete these 2 sides this coming week. This will leave only the South wall before all the plaster work is DONE – inside and out!!! The great news with the tile and plaster work finishing up is that the painting can get underway. In fact, Lloyd the painter has already started prepping the first floor units for primer and should have them completed by the end of the coming week. Then he can move to the exterior and rooftop to help us stay ahead of schedule. Work on the pool started just 3 weeks ago with the excavation, and as you can see the work is progressing rapidly. The exterior of the pool has been completed with the necessary fixtures for drains, lights, skimmers and return lines already installed. The walls of the pool have been back-filled and the crew began forming for the pool deck and mechanical room, as seen in the 2nd photo. While this is going on, Omar’s crew has managed to dig and build the septic system which is ready for hook-up! It seems like a quick and easy thing to do – but it was a 2-3 man project that took almost 3 weeks. 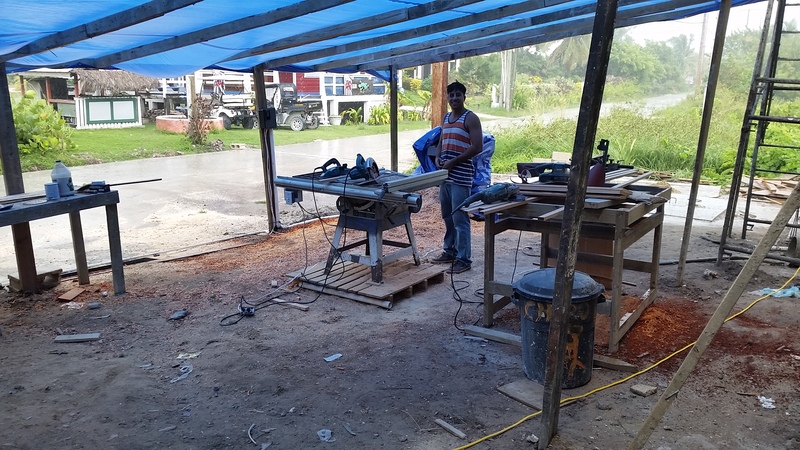 Omar’s crew also built a temporary wood shop just to the west of the building. The table saw, planer, joiner and routers have been brought in and hooked up. Erwin is busy constructing the closets for the first floor units and will start the bathroom vanities this week. 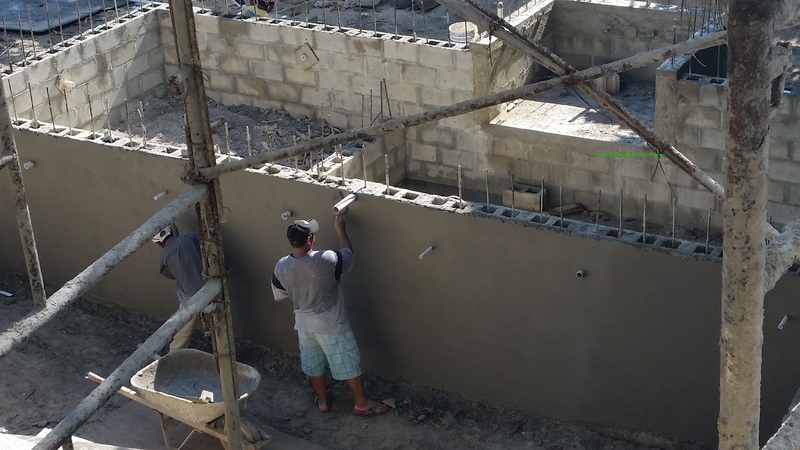 Omar is planning on assigning 2 more carpenters to help Erwin as soon as the pool deck framing is finished. Erwin has a lot of work to do in the next 6 weeks. He will be building all the cabinets, closets, vanities AND some furniture we will be using in the project. We’ve designated the area under and around the blue tarp as a “No Chat” zone. You can see that Erwin has already been busy with all the Mahogany sawdust around. This area is cleaned every day and the sawdust removed – but it seems never ending! We contracted out the doors to a local cabinet maker and may have to give more doors to a 2nd contractor to stay on schedule. So far, we have 4 doors completed and need a total of 28. The first four came out beautifully, and we’re pushing the contractors for more. Speaking of doors, the east side of the building has 8 96″X84″ sliding doors to allow for the full view of the barrier reef. You may have noticed that we don’t have any doors or windows installed yet. It’s a long story, but suffice it to say we were given a lead time of 5 weeks for the hurricane doors and windows. We added 2 weeks for good measure and expected doors and windows no later than September 30th. We were told on November 9th that the doors were finally in Belize and would be delivered by the Friday the 13th. As yet – no doors and windows! We opted for the hurricane standard doors which give added security and protection from flying objects. These doors and windows are coming from PGT Industries and can take a direct hit from a 2×4 traveling at 150 mph without breaching. It’s also next to impossible for a burglar to get in even with a baseball bat or hammer! We have also been very busy with trying to furnish the project. Shopping for everything from furniture like couches, tables, chairs, nightstands to dishes, appliances and TVs. When we feel like we have that under control, we will start chasing down plumbing fixtures such as sinks, shower heads, faucets, knobs – you name it. Even the small things like hangers, silverware, towel bars, sheets, bath towels and trash bins seem like a never ending hunting and gathering chore. Lest we forget outdoor tables, loungers, chairs and door mats. Oh, and door knobs, locks, light fixtures, ceiling fans, lamps. Even now, we’re forgetting something, right? All these things have been ordered and are sitting in warehouses in Belize City – waiting for shipment to the island as soon as we are ready for them. At least all the things on our check lists. Is it possible we’ve thought of everything? The last part of the puzzle that we have been struggling with is air conditioning. We were supposed to have the AC units here and installed about mid October. We have been having a nightmare locating the correct components for the layout we need. We’ve been told, “don’t worry, they are available”. But how does someone building a boutique hotel in Central America not “worry” about AIR CONDITIONING??? All will be fine we’re sure – or at least as sure as we can be. We’ve been asked many times when our expected opening will be, and it remains a difficult question to answer. Rainy season is in full force and although it hasn’t held us back yet, weather is a factor. If everything continues to go as planned, and the things that haven’t gone as planned get remedied, we expect that we will be opening around mid January. But a lot has to happen before that can happen – which is why we’re signing off now. Need to send some more emails and prepare for the week ahead. Thanks again for reading and following this blog. As always, we appreciate your comments and thoughts. Feel free to share it on your Facebook page so that other people who may want to experience San Pedro Belize can follow along also. It’s going to be beautiful guys! Congratulations! Thanks Bill. It’s coming along. Sprint to the finish as they say! Sounds so exciting and I can’t wait to see all this in person!!!! We can’t wait for you to see it up close and personal, too, Deb! Busy busy here, trying to bring this one to a finish!